Dr. Zurn-Birkhimer joined the Women in Engineering Program in 2017. She previously held the Associate Director position from 2007-09 and has also served as an Assistant Department Head of Purdue’s Earth, Atmospheric, and Planetary Sciences Department, Deputy Director of Purdue’s Center for Faculty Success, and Associate Professor and co-Chair of Mathematics at Saint Joseph’s College (Rensselaer, IN). 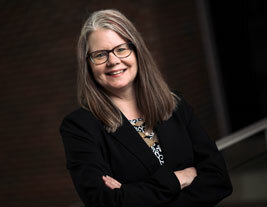 As Associate Director, Dr. Zurn-Birkhimer leads retention activities including administration of the undergraduate and graduate mentoring programs and teaches two Women in Engineering seminar courses. She is also developing a research branch for the program. For the past decade, Dr. Zurn-Birkhimer’s research has focused on broadening participation of women and underrepresented groups in STEM fields. Recently, she has been investigating the intersection of education and career path with cultural identity. Moving forward, her research team plans to develop strategies to inform programming and policies that facilitate recruitment and retention of underrepresented populations in academia. In 2012, Dr. Zurn-Birkhimer was presented with an Outstanding Alumni Award from the Department of Earth, Atmospheric, and Planetary Sciences at Purdue University. She also serves on their Alumni Advisor Board. Dr. Zurn-Birkhimer earned her B.S. in Mathematics from the University of Minnesota, and an M.S. and Ph.D. in Atmospheric Science from Purdue University.